Bagenal’s Castle, having loomed large in the history of Ulster during the 16th century Elizabethan wars, again featured in the 17th century and for all the wrong reasons. The area near the castle was the scene of a massacre of the Irish in the aftermath of the great rebellion of 1641. These affairs were well documented by the records and correspondence of the officers and men of the army of General Robert Munro, commander of an army of Scottish Presbyterians who captured the town and castle in May 1642. Attempting to analyse events in Newry in the period 1641/1642 one meets the problem of sources. Most of the evidence for the murders of the Protestants of the town is to be found in what have become the 1641 depositions (testimonies) which can be found in the Trinity College archive. These depositions were statements taken from Protestant eye witnesses of the massacre which by their very nature are a contentious source. These sources have been accused by their detractors as propaganda designed to whip up anti-Irish feeling and were used in parliament by the Puritans as an excuse to take action against the native Irish. Oliver Cromwell himself, said after the massacre of Drogheda, that, ‘it was a righteous judgement by God upon barbarous wretches whose hands was imbued with the blood of innocent Protestants’.1 Colonel Turner, one of Munroe’s leading officers said that the Irish were, ‘Godless rogues’. Newry was captured during the planned national rebellion on 23 October 1641. The attack on Newry by the Magennis clan was led by Colonel Con Magennis, and John Magennis, other leading rebels being Patrick Creely, Dennis Crealy, Nicholas White, James White and James Hilden who was the principal man involved in the betrayal the Castle of Newry. The Castle of Newry was fortified by Nicholas Bagenal, Lord Marshal of Ireland in the 1560’s and had remained in English hands ever since until its capture in 1641 by the Irish. It is estimated that up to 27 colonists died in the capture of Newry, a number which cannot be verified for sure. If there is some doubt about the numbers of colonists killed, there is little doubt about the killings that took place after the town was recaptured by the forces of General Munro. These reports were written by the men serving with Munroe and by Munroe himself. General Robert Munro landed on 15 April 1642 at Carrickfergus with an army including 1,600 of his own men, 400 of Lord Ards, 500 of Lord Conway’s cavalry, including some colonists from East Antrim, 500 of Colonel Chichester’s men and 400 of Lord Clandeboy’s who met together and encamped at Drumbo. They proceeded towards Newry from Lisnagarvey stopping at Lochbrickland to massacre the refugee Irish who occupied the island. On 30 April Munroe’s army reached Newry after burning the chapel at Clonduff. On 1 May, 1642 Munro’s army led by Lord Conway’s cavalry attacked the town driving the town’s people in all directions. It is said that 80 or more Irish were killed making a stand with a makeshift barricade at this spot by the cavalry, after which the minister who accompanied the troops walked amongst the bodies prodding them with his stick remarking ‘how well fed these Irish were’. Many people fled into the castle and took refuge therein. Munro’s summons to surrender was refused by Magennis who told him that he could hold out for months. Munro then threatened to blow up the castle with his supply of gun powder along with its garrison and prisoners. By May 1642, the powder available to the Irish was down to half a barrel with not more than one dozen serviceable muskets. The original 99 barrels and the store of arms held by the rebels upon the capture of the castle could have been dissipated by supplying other places held by the rebels. Magennis surrendered on 3 May having been granted terms by the victors. The English prisoners, Sir Charles Poyntz and Captain Smith, held since 23 October 1641, were released unharmed by the Irish. The terms as it turned out, only applied to the Irish soldiers and not the civilians of the town. On 6 May 1642, three days after the surrender, 60 men and two priests were killed on the bridge over the river near Bagenal’s castle. Those priests (the Pope’s peddlers according to Roger Pike) were a Cistercian, a Fr. Crilly who was the last Cistercian Abbot of Newry, and a Fr. Malachy Shiel who was Prior of Newry. ‘ we entered into an examination of the town’s people, all were papists, the indifferent severed from the bad, where of 60, with two priests shot and hanged, the indifferent are banished‘. 8 Many of those indifferent were then press-ganged into Munro’s army to serve as bearers in Lord Conway’s regiment. Leslie had no stomach for such butchery and returned to Scotland. The nixt day most of them who had not been in the castle were carried to the bridge and butchered to death some by shooting, some by hanging without legal process. I was verily informed afterwards that innocent people suffered. On the same day, soldiers attacked 150 women who had been held in the castle and drowned eighteen of them in the river which was in flood. The soldiers were eventually restrained by Sir James Turner, one of Munro’s officers. After a week spent in Newry where he burnt all the houses in the town, Munro retired to Carrickfergus on 7 May leaving Col. Sinclair, ‘ to banish all the Irish out of the towne as soon as he was gone’. 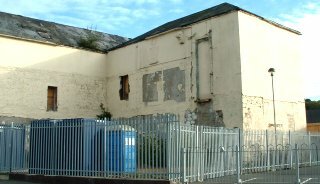 Munroe left in charge, a garrison of three hundred in Newry but the soldiers did not find Newry a comfortable station due to lack of shelter and the inevitable disease that followed. Thus Bagenel’s Castle and its immediate area takes its place in Irish history along with Drogheda, Wexford Town and Vinegar Hill as a scene of massacre. When you stand and look around you at the Castle, think of the citizens of Newry who were done to death near here in May, 1642. 2 Deposition of Elizabeth Croker, Trinity College Dublin, MS 837. 4 Deposition of 1641, Trinity College Dublin,MS 837. 6 Papers Relating to the Insurrection of 1641, p 121 (T.Fitzpatrick, Sealy, Byres and Walker, Dublin,1903). 10 Papers Relating to the Insurection of 1641, p.123/125, (T.Fitzpatrick, Sealy, Byres and Walker, Dublin,1903). 14 Papers Relating to the Insurrection of 1641, p.127,( T.Fitzpatrick, Sealy, Byres and Walker, Dublin,1903). Comparative article by Dr John McCavitt ?